c1900 photograph of a young woman identified as Laura B. Hamilton. The photograph was taken by the Bishop studio, but there's no mention of location. There were many studios operated by someone named Bishop. Langdon's List of 19th & Early 20th Century Photographers in the United States from 1844-1950 lists 26, and there were likely more. And more still in Canada, where Laura may have lived. If you recognize this Laura B. Hamilton from your family photos and research, please leave a comment or contact me directly. Carte de visite of a handsome man taken by the Enos Crockett studio of Rockland, Maine. 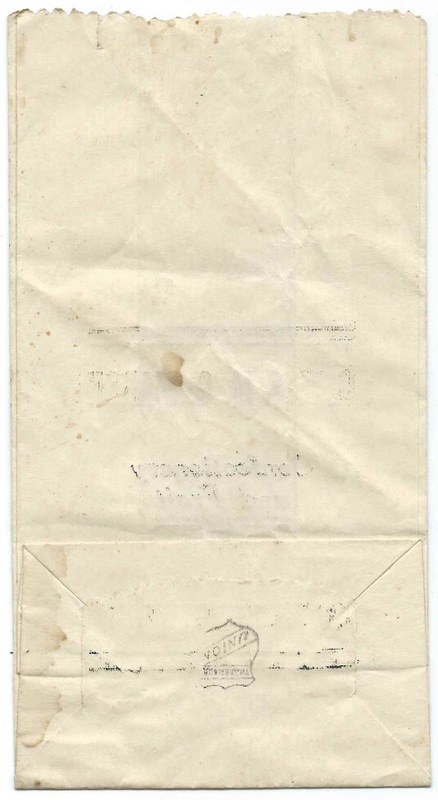 The handwriting below the man's image is obscured by a thick stain. 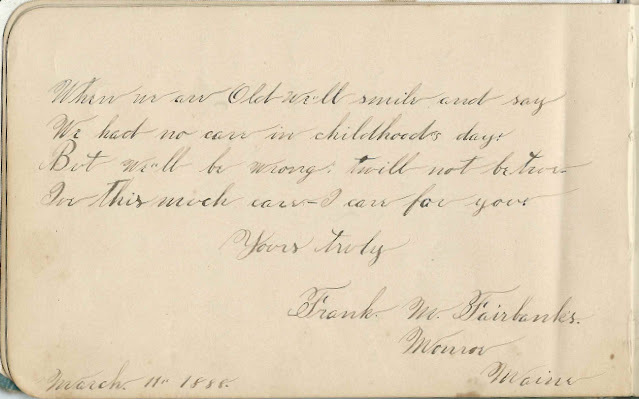 It's possible that the line of handwriting above is "Yours Truly", and the line below is "Orland". However, it's also possible that what I'm thinking is "Yours Truly" might be something else, perhaps his name. I can't tell if there is another word beyond what I've construed, possibly erroneously, as "Truly". If the top line is a name, it's possible that "Orland" refers to the Hancock County town of Orland, Maine. I'm leaning toward "Yours Truly" and a given name of "Orland". I found several men with the given name "Orland" of a plausible age in and around the Rockland, Maine, area. 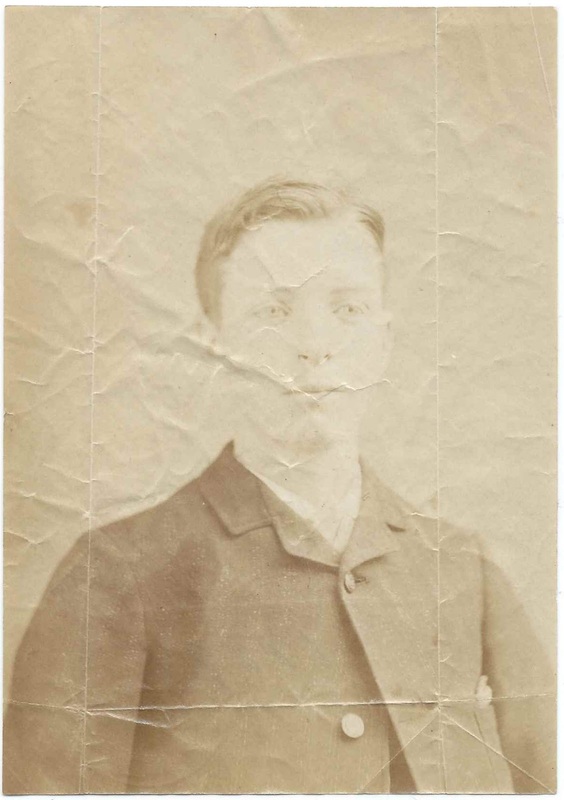 Hopefully a reader will recognize this fellow from family photos and research and will forward his name. Read more about photographer Enos Crockett (1815-1876), a saloon owner and photographer, here, at the Maine Memory Network. 1857-1862 autograph album owned by a Laura from Waldoboro, Maine, presumably Laura V. F. Overlock, future wife of Theodore Stanley Brown. 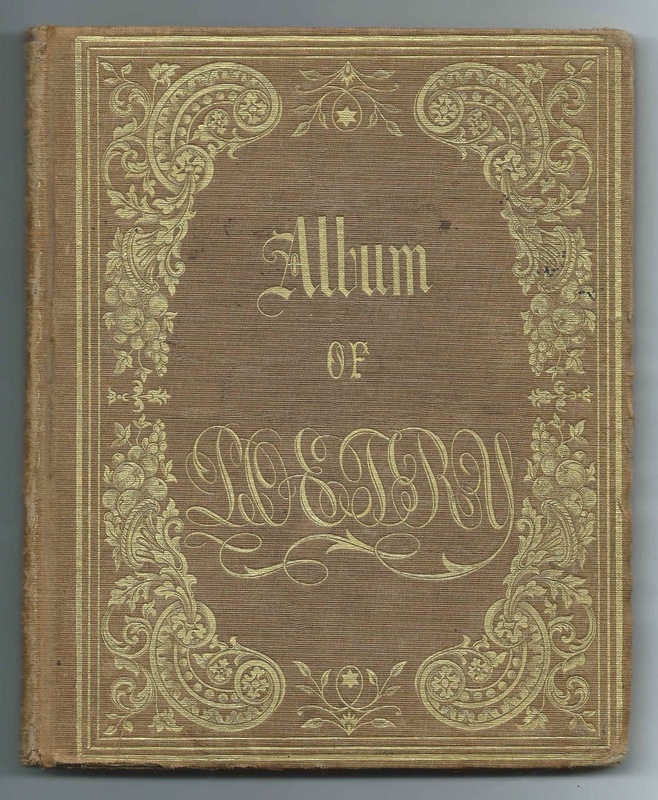 "The Album of Poetry" measures approximately 7-3/4" by 6-1/4" and was printed by the Moss & Brother of Philadelphia, Pennsylvania. 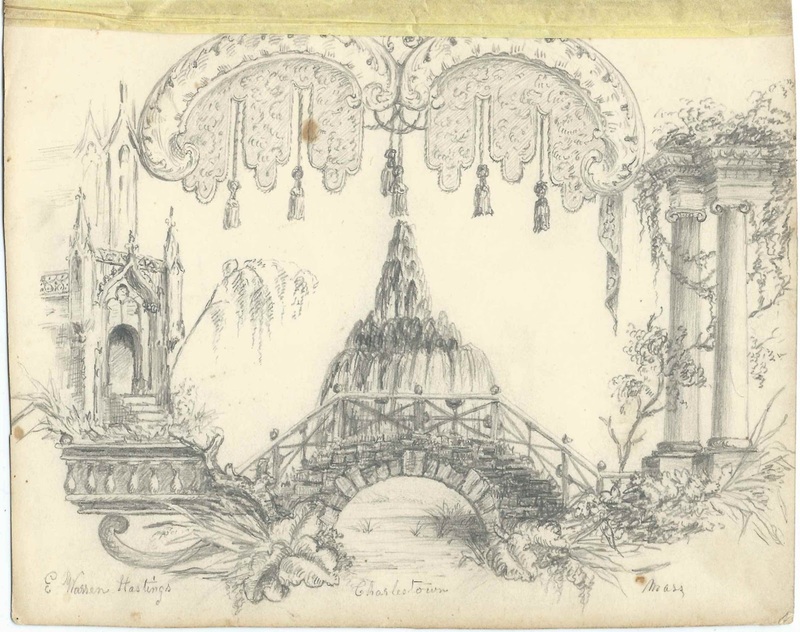 It contains six full-page engravings, two of what appear to be original art works and the sentiments of 47 of Laura's relatives, friends and schoolmates. 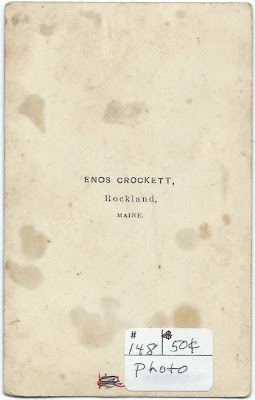 Tucked in a page inscribed by E. Winnie Overlock at Waldoboro, Maine, on February 14, 1858 is the photograph of an unidentified young man. E. Winnie Overlock was the sister of Laura V. F. Overlock, the album's presumed owner. 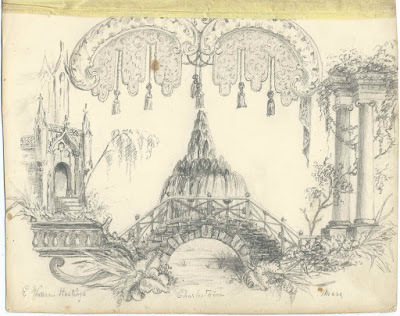 Also tucked in is a wonderfully intricate drawing by E. Warren Hastings of Charlestown, Massachusetts. An incense burner fashioned by E. Warren Hastings in 1871 is held at the Smithsonian Institution. Another page contains a hand-painted illustration containing the names of Ella M. Cochrane and James H. Cochrane. Laura V. F. Overlock was born, according to her death record, at Waldoboro, Maine, on March 18, 183x, with the last digit hard to decipher. It may have been 1839, as most census records seem to indicate a birth around 1839 or 1840; there's a later penciled notation of "40". Her parents were Thomas Overlock and Elizabeth M. (Pollard ?) 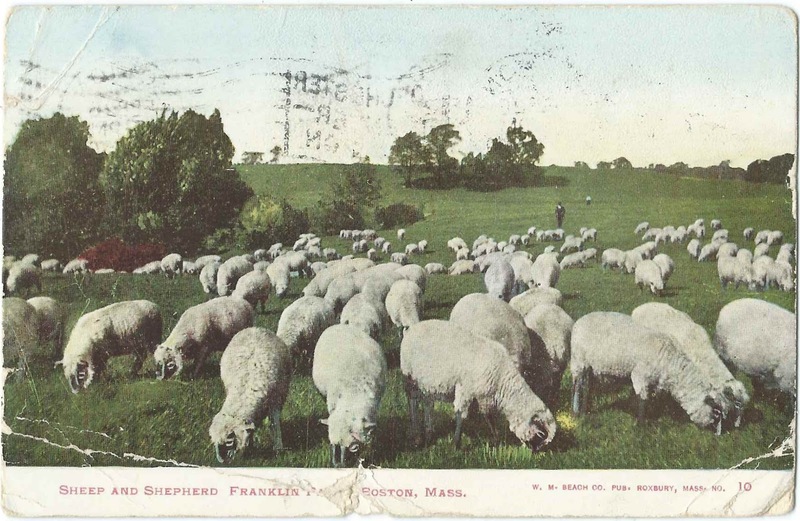 Overlock, who were born at Waldoboro, Maine, and Brunswick, Maine, respectively. On November 17, 1863 at Waldoboro, Maine, Laura V. F. Overlock married Theodore Stanley Brown, son of Charles Sampson Brown and Susan Noyes (Robinson) Brown. Theodore was born at Waldoboro, Maine, about October 1833. 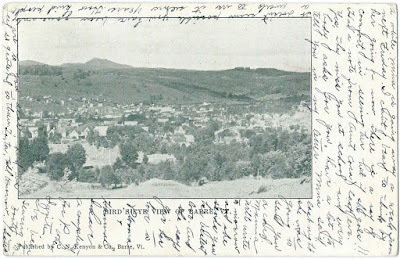 Thomas inscribed a page in Laura's album at Waldoboro, Maine, on January 20, 1858. 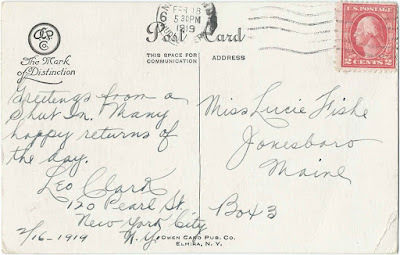 Laura V. F. (Overlock) Brown died at Waldoboro, Maine, on April 21, 1919. B B ? Dow Ludden ? Castner Harriman S S ? Hard to read if this is a name or an unsigned inscription: ? Tasos Derar pappateuas ? Theodore S. Brown, inscribed at Waldoboro, Maine, on January 20, 1858. 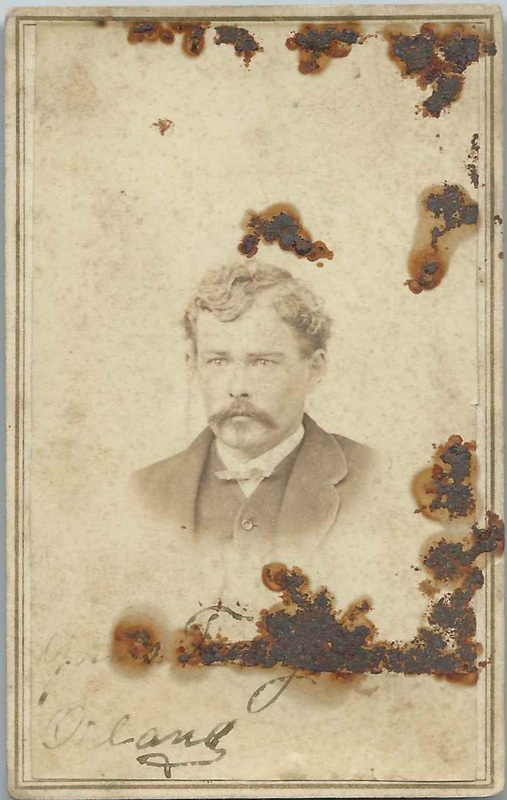 Presumably Theodore Stanley Brown, who would marry Laura V. F. Overlock, album owner, in 1863. 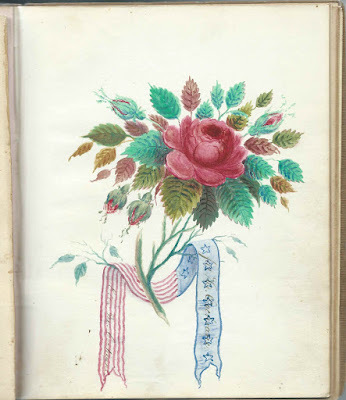 Hand painted illustration with the names of Ella M. Cochran and James H. Cochrane worked into a scroll. Lizzie W. Kimball of Waldoboro, Maine. 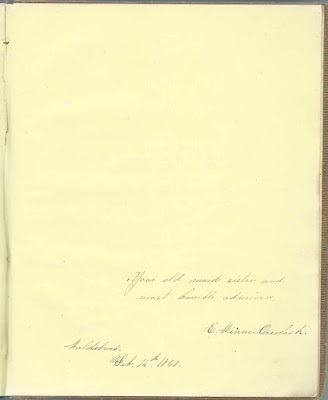 She may have been Elizabeth (Winchenbach) Kimball, and it may have been her husband, Nathan R. Kimball, who inscribed the facing page as N. R. Kimball. N. R. Kimball; not sure of initials; he pasted two photographs of himself on the page. He may have been Dr. Nathan R. Kimball, and it may have been his wife Elizabeth (Winchenbach) Kimball, who inscribed the facing page as Lizzie W. Kimball of Waldoboro, Maine. 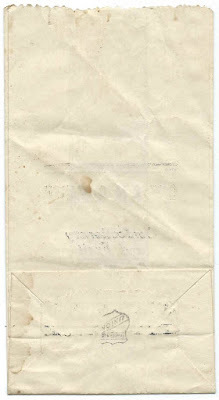 Scrap of paper pasted on a page with two names: L. V. F. Overlock and J. Ludden [?]. L. V. F. Overlock is presumably the album owner Laura. E. Winnie Overlock, inscribed at Waldoboro, Maine, on February 14, 1858; sister of album owner Laura V. F. Overlock. A photograph of a young man is tucked in this page, but whether there is a relationship to the inscriber of not, I don't know. E. A. L. Stacey, inscribed at Waldoboro, Maine, on March 29, 1857. 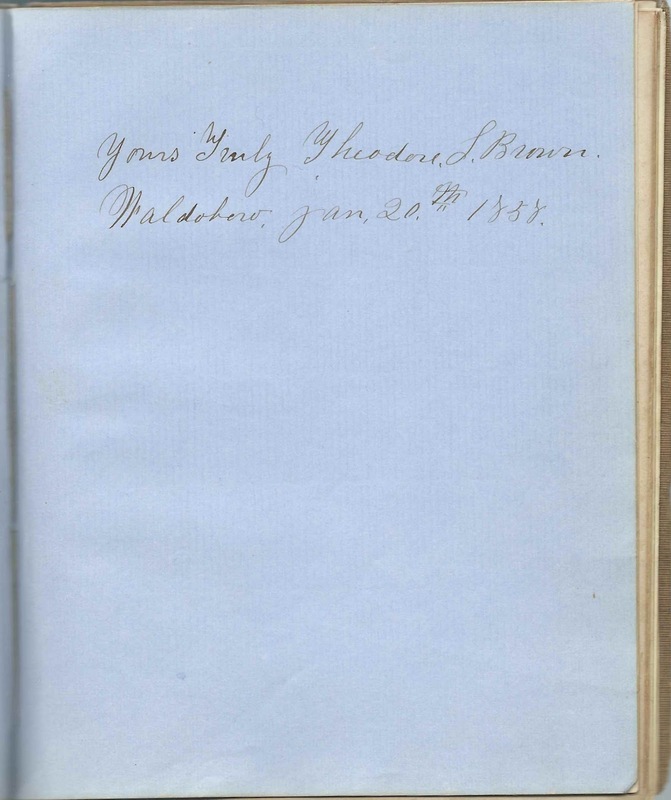 Thomas Lightbody also inscribed the page. 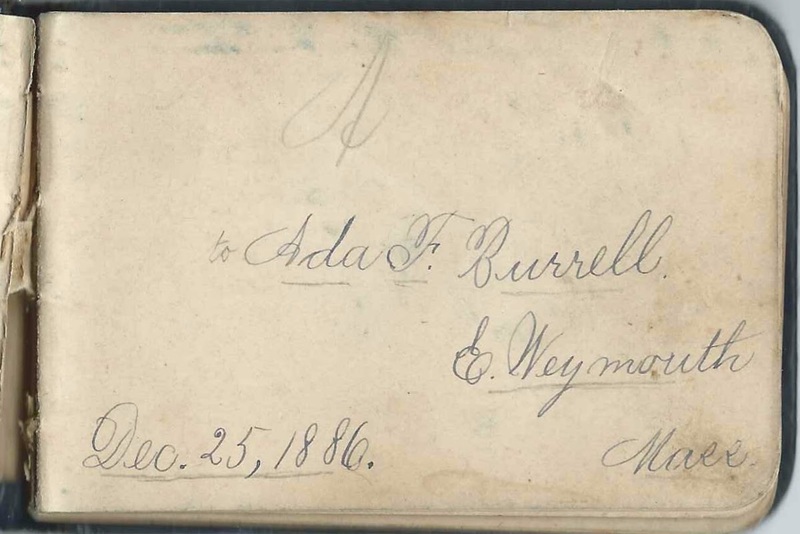 Autograph Album of Ada Frances Burrell of East Weymouth, Massachusetts. The ownership page has a date of December 25, 1886, as if the album had been a Christmas present. 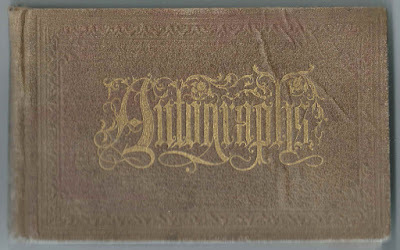 However, there are some inscriptions dated earlier in 1886, so perhaps she had received the album in 1885. 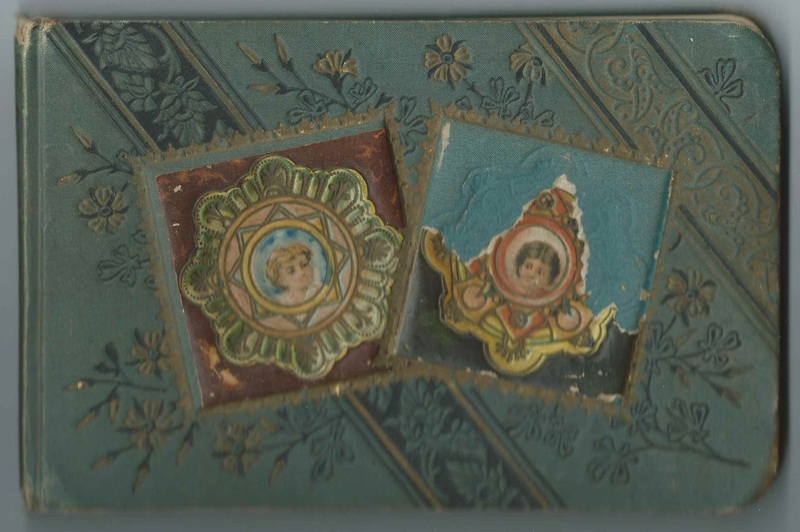 The album measures approximately 4" by 2-3/4" and contains the sentiments of 24 of Ada's relatives, friends, schoolmates and teachers; two inscribed multiple pages. An alphabetical surname list and an alphabetical list of the inscribers, together with any personal information they offered, appear at the end of this post. 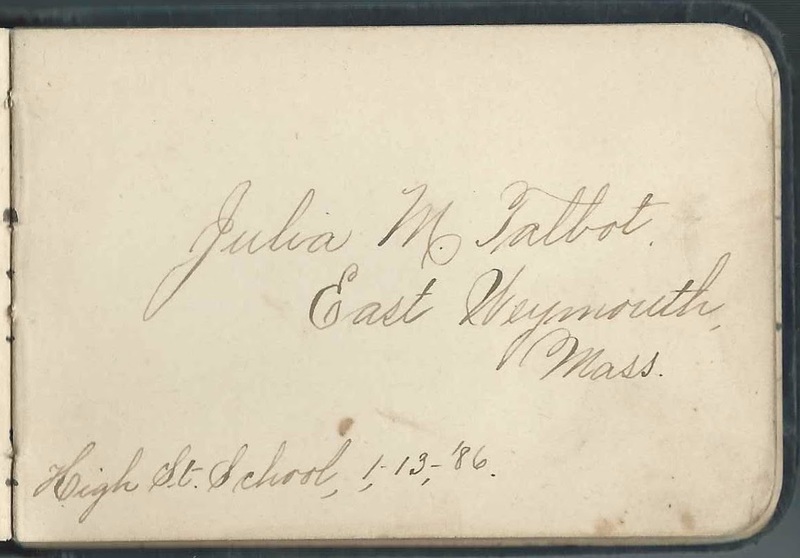 Julia M. Talbot of East Weymouth, Massachusetts, inscribed a page at High Street School on January 13, 1886. Ada Frances Burrell was born December 1, 1876 at Weymouth, Massachusetts, the daughter of Henry Herbert Burrell and Marie Antoinette (Laughton) Burrell. 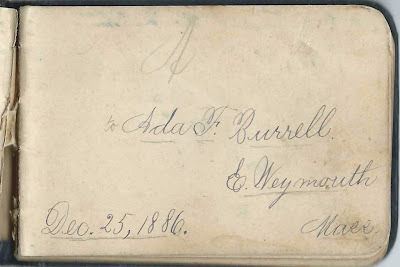 Ada had at least 3 siblings, two of whom, Lillie Otis Burrell and Jennie May Burrell, inscribed pages in Ada's album. Jennie inscribed multiple pages. 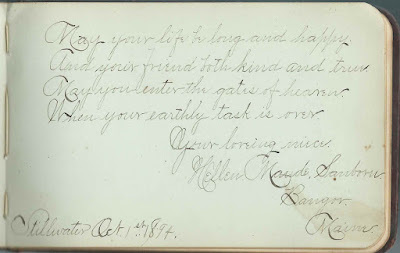 Ada's maternal aunt, Cemira Adelaide (Laughton) Raymond, inscribed a page. 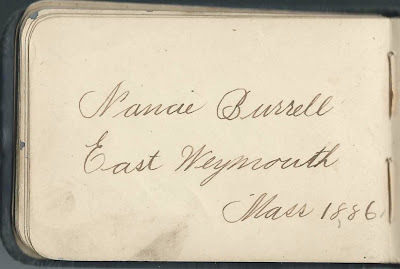 Nancie Burrell of East Weymouth, Massachusetts, inscribed a page in 1886. 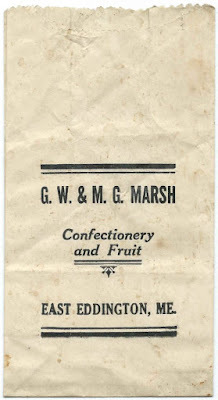 On July 29, 1904 at Weymouth, Massachusetts, Ada married William E. Dasha, son of John J. Dasha and Sarah A. (Bicknell) Dasha. 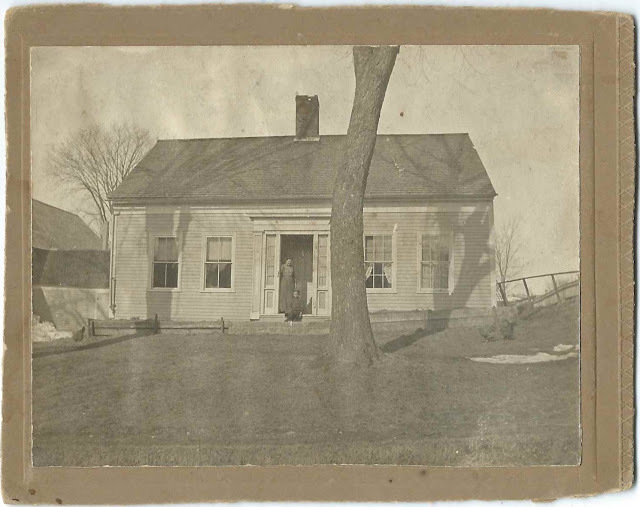 Ada and William raised their family at Weymouth, Massachusetts. Ada died in 1962 and William inn 1963. They're buried in the North Weymouth Cemetery at Weymouth, Massachusetts. If you have corrections to the information above, or stories to share about the Burrell family or any of the other inscribers, please leave a comment or contact me directly. Ada F. Burrell of East Weymouth, Massachusetts, dated December 25, 1886 [there were autographs from before this date]; Ada, the album owner, presumably received the album as a Christmas present. 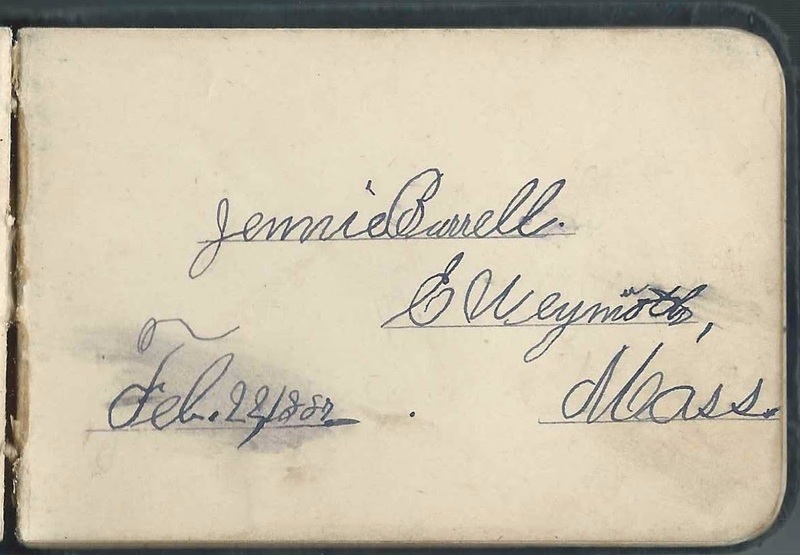 Jennie Burrell of East Weymouth, Massachusetts, inscribed on February 22, 1887; she inscribed other pages as well, one of them on May 18, 1888. Aunt Myra. She was Cemira Adelaide (Laughton) Raymond, sister of Ada's mother Marie Antoinette (Laughton) Burrell. 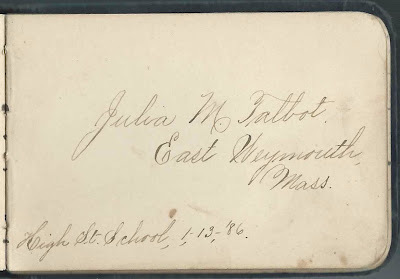 1885-1894 autograph album that belonged to one of the children of John and Anabella (Taylor) Gould of Stillwater, Maine, Nova Scotia natives who settled in the Bangor, Maine, area of Stillwater and Old Town. 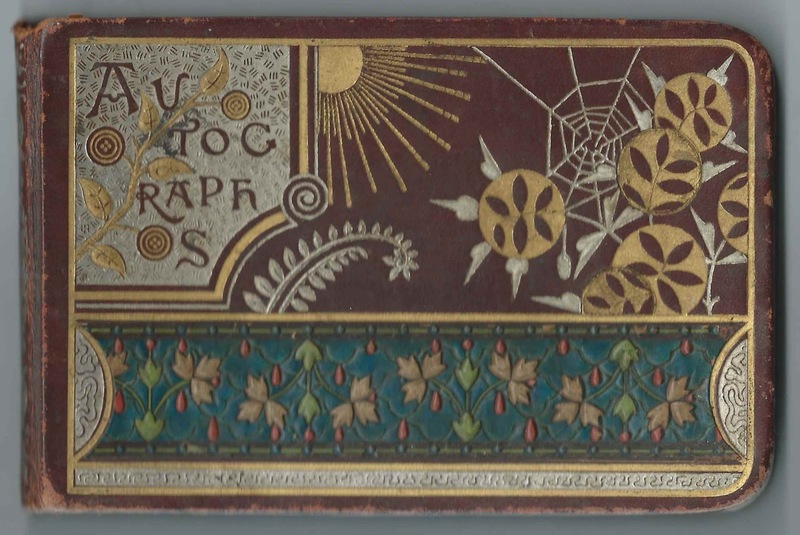 The album measures approximately 6-1/4" by 4" and contains the sentiments of 14 of the album owner's relatives and friends. 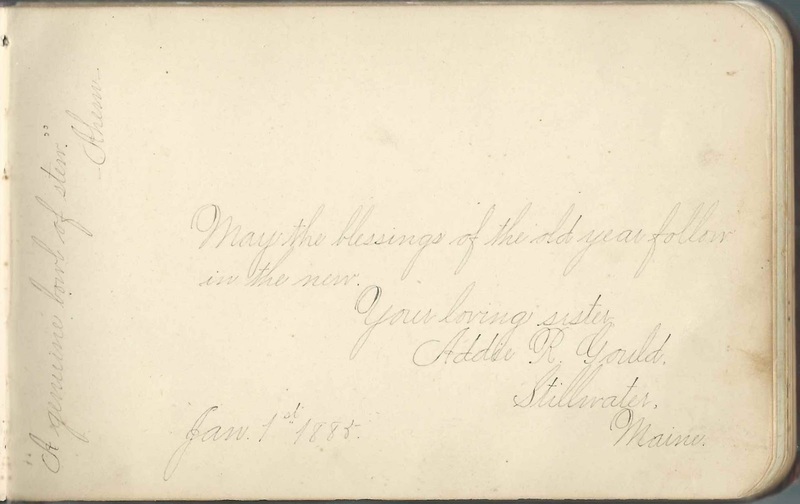 The album owner's sister, Addie R. Gould of Stillwater, Maine, inscribed a page as "Your loving sister" on January 1, 1885. She, therefore, was not the album owner. The album owner's niece, Hellen Maude Sanborn, daughter of Isabelle (Gould) and Willis Henry Sanborn, inscribed a page at Stillwater, Maine, on October 1, 1894, the latest inscription in the album. Because she described herself as a niece, her mother, Isabelle (Gould) Sanborn was not the album owner. 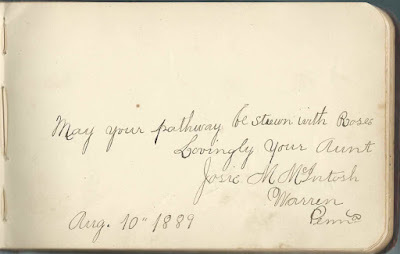 The album owner's aunt, Josie M. McIntosh of Warren, Pennsylvania, inscribed a page on August 10, 1889. 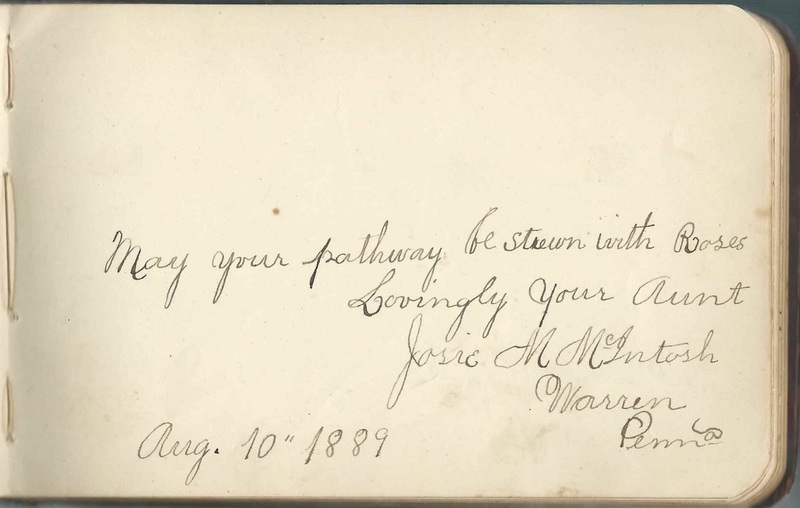 Percy A. Horn of Stillwater, Maine, inscribed on "4-3-1887"
Hellen Maude Sanborn of Bangor, Maine, inscribed at Stillwater, Maine, on October 1, 1894; "your loving niece". Daughter of Isabelle (Gould) Sanborn, wife of Willis Henry Sanborn. So Isabelle is not the owner of the autograph album. If you have corrections to the information above, or information on any of the inscribers, please leave a comment or contact me directly. 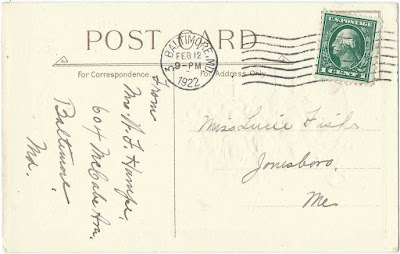 6 postcards sent to the Fish or Fishe sisters of Jonesboro, Maine - four to shut-in Lucia L. Fish, "Lucie", and one each to Georgia Lindsey Fish and Elizabeth M. Fish, "Beth". They were the daughters of George Washington Gates Smith and Lizzie Madge (Drisko) Fish of Jonesboro, Maine. 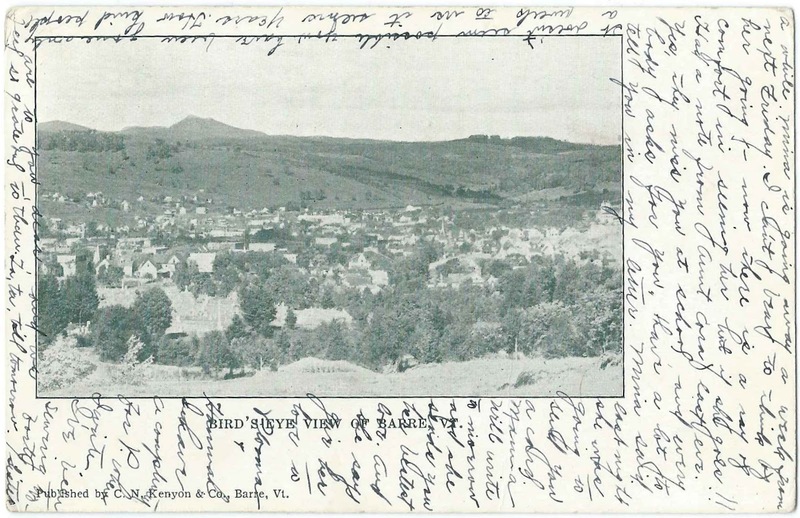 The postcard sent to Georgia shows a Bird's Eye View of Barre, Vermont and contains a long message. 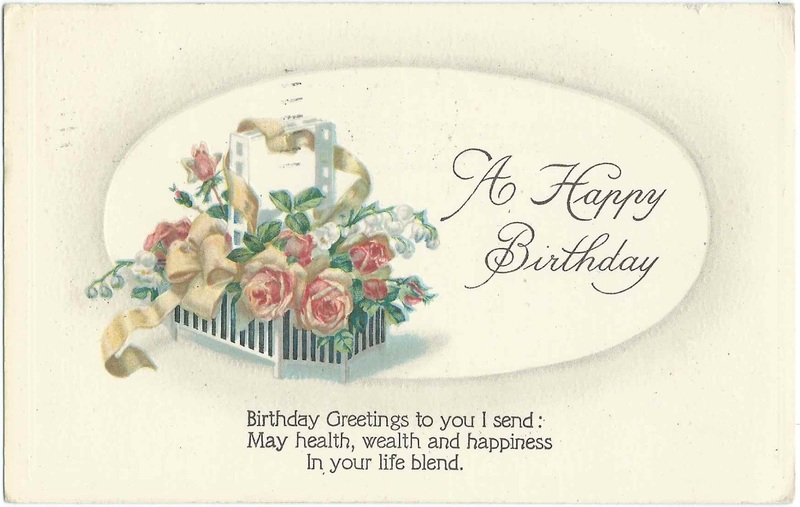 See the card and a transcript at the end of this post. Arthur's Home Magazine, Volume 53 of 1885, contains an article that described the founding and mission of the Shut-in Society in 1885, most likely by its first president, Mrs. Helen E. Brown. The second president was a shut-in herself, a Mrs. J. M. D. Conklin. Other members included Miss E. E. Burge; Mrs. May S. Dickinson; Miss Annie E. Fuller; Miss E. Proudfit; Miss Jennie Cassidy; Mr. W. C. Mather; Mrs. M. E. Sangster; Miss Hester Bates; Miss M. Hitchen; Mrs. Kate S. Burr; Annie S. Bartlett. Mrs. May S. Dickinson may have been the author, educator and humanitarian Mary Lowe Dickinson, a Fitchburg, Massachusetts, native, who married New York City banker John Dickinson. Another article about the Shut-In Society appeared in the Cambridge Tribune issue of July 4, 1896. At that time, the secretary of the organization was Miss Mary Hamilton Hartley of 14 Lincoln Street, New Haven, Connecticut. Lucia Leigh Fish, "Lucie", was born February 26, 1890. She died in 1956. Georgia Lindsey Fish was born January 14, 1895. She married William Noland Morris, "Willie", at Jonesboro, Maine, on August 15, 1915. Willie died in 1972 and Georgia in 1982. 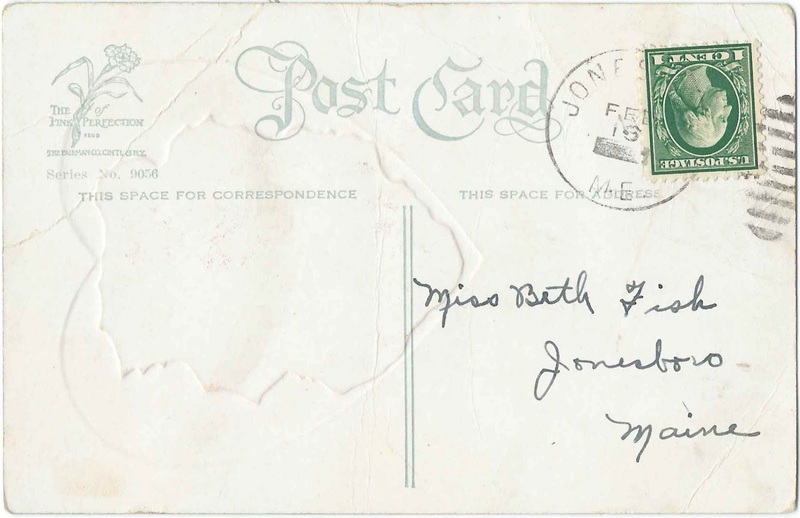 The postcards sent to her were dated 1909, 1919 and 1922. Georgia Lindsey Fish was born January 14, 1895. She married William Noland Morris, "Willie", at Jonesboro, on August 15, 1915. Willie died in 1972 and Georgia in 1982. Elizabeth M. Fish, "Beth", was born October 28, 1903. She died in 1988. 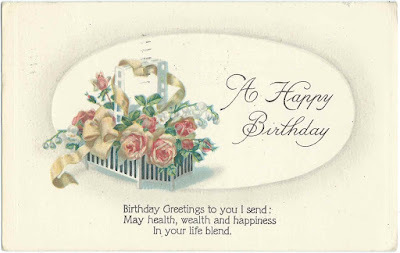 There was another daughter, Cecile or Cecilia, born in 1899, but she died in 1903, before these cards were sent. 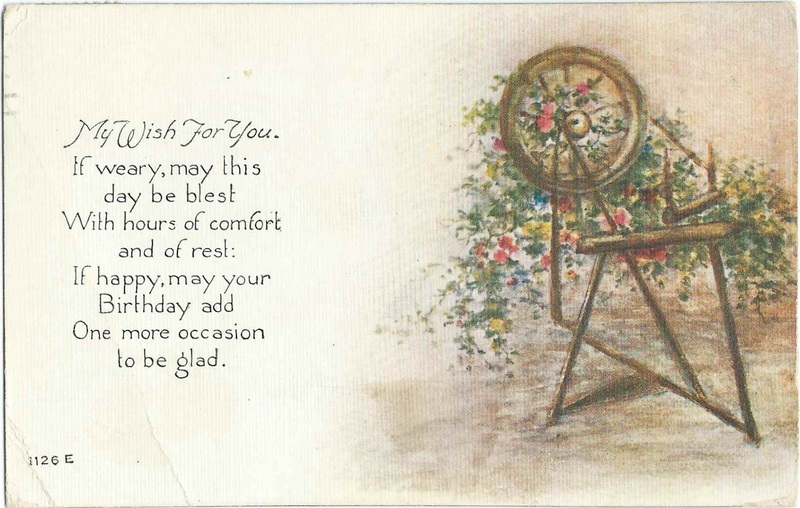 Card sent by Ethel Ladd, a shut-in at Santiago de las Vegas, Cuba. She notes that her father raises strawberries for market. Ethel Arline Ladd was born October 22, 1897 in Vermont, daughter of William Porter Ladd and his second wife Sarah Agnes (Sanborn) Ladd. Her father, according to an online reference, once lived on a pineapple farm at Santiago de las Vegas. The family later moved to Volusia County, Florida. Ethel must have fought through whatever kept her a shut-in, as she went on to marry Albert C. Tyler and have at least one child. Ethel died in 1982 and is buried with her brother Eugene Philip Ladd in the DeLand Memorial Gardens cemetery at DeLand, Florida. Hopefully a reader will have more information. 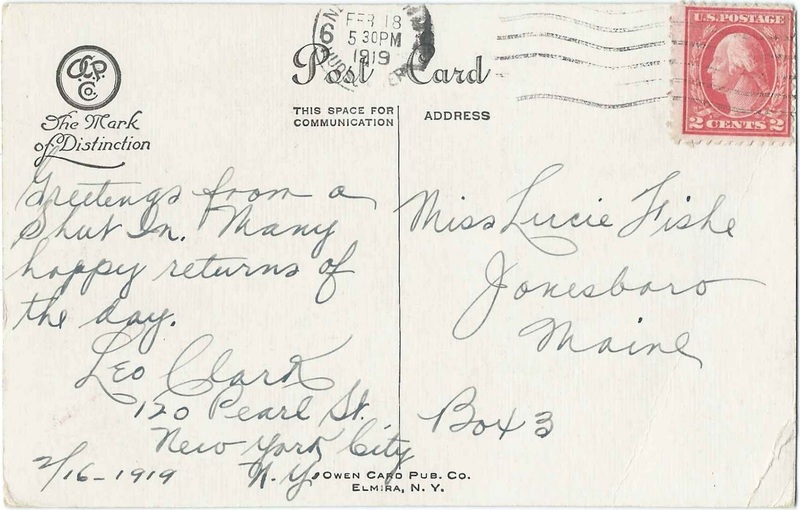 Card sent to Miss Lucie Fishe by Leo Clark, 120 Pearl Street, New York, New York, in 1919. 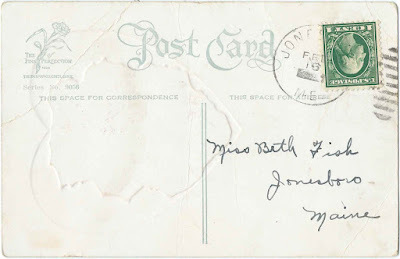 Card sent to Miss Beth Fish with no sender information and the postmark obstructed. Card sent in what appears to be 1913 by "Sister" to Miss Georgia L. Fishe at Salem Depot, New Hampshire, in care of E. B. Hall, R.F.D. 1. "Sister" may have been either Lucia or Beth. "The show that is here is just the same as when it was here last year. Al Martz is to be here the 17th. Ruth's cold is about the same. Mina gets our mail for us at night. Last eve she and H was up and talked to me quite a while. Mina is going away next Friday. I can't bear to think of hr going - now there is a ray of comfort in seeing her but if she goes!! Had a note from Aunt Cora last eve. Yes they miss you at school and everybody asks for you. Have a lot to tell you in my letter. Mina said last night she was going to send you a card. Mama will write tomorrow and she sends you her bestest love. And she says give her love to Ploma and Hannah. I have a __ for P when I write. I've been sewing two forty. It doesn't seem possible you have been gone only a week. To us it seems years. How kind people are to you, dear, and we feel so grateful to them. Tata, til tomorrow." If you can supply the missing word in the message above or provide more information on the people mentioned or the Fish or Fishe sisters themselves, please leave a comment or contact me directly. The album measures approximately 7-3/4" by 5" and contains the sentiments of 80 of Cora's relatives, friends and schoolmates. An alphabetical surname list and an alphabetical list of the inscribers, together with any personal information they offered, appear at the end of this post. Cora Mabel Libby was born November 28, 1870 at Winterport, Maine, the daughter of David Libby and Mary A. (Torrey) Libby. 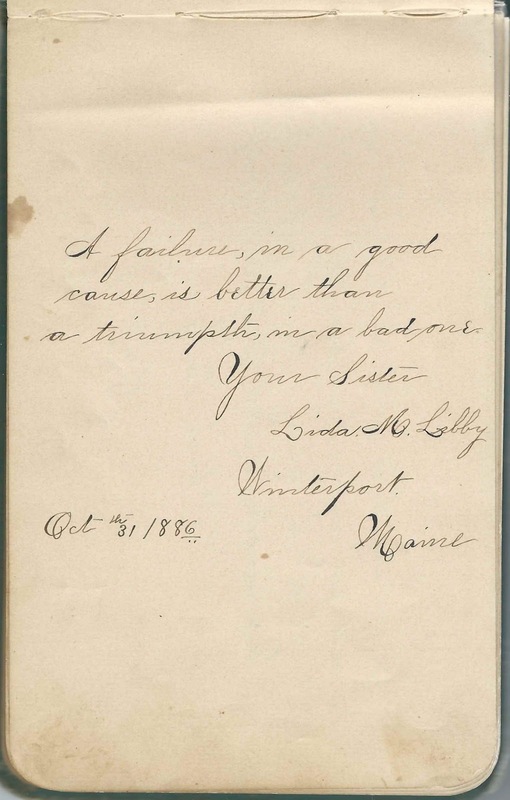 Cora's sister Lida M. Libby inscribed a page at Winterport, Maine, on October 31, 1886; she was Mary Eliza Libby. 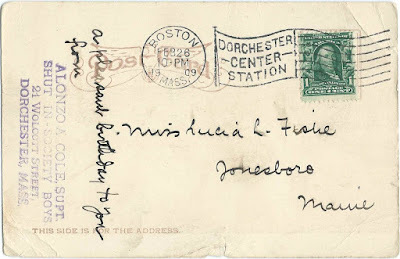 One inscriber, M. Haley, or N. Haley, who inscribed her page at Winterport, Maine, on February 26, 1887, called herself Cora's aunt. 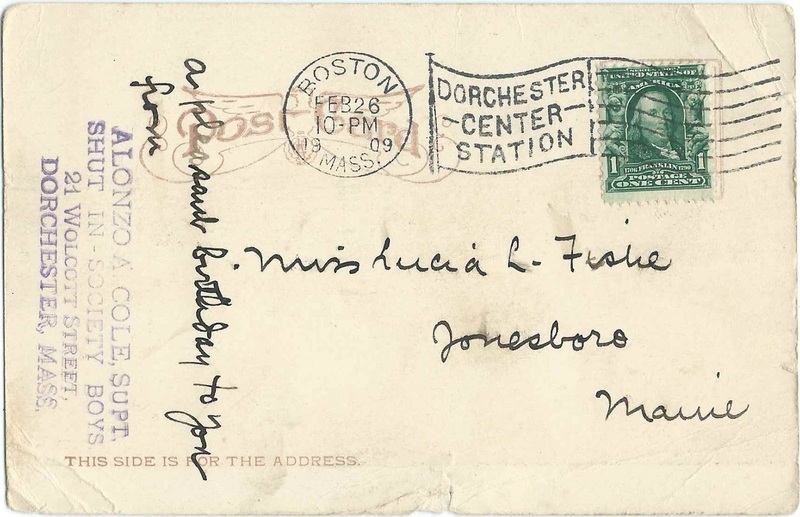 Her handwriting appears that of an elderly person, so perhaps she was a great aunt. 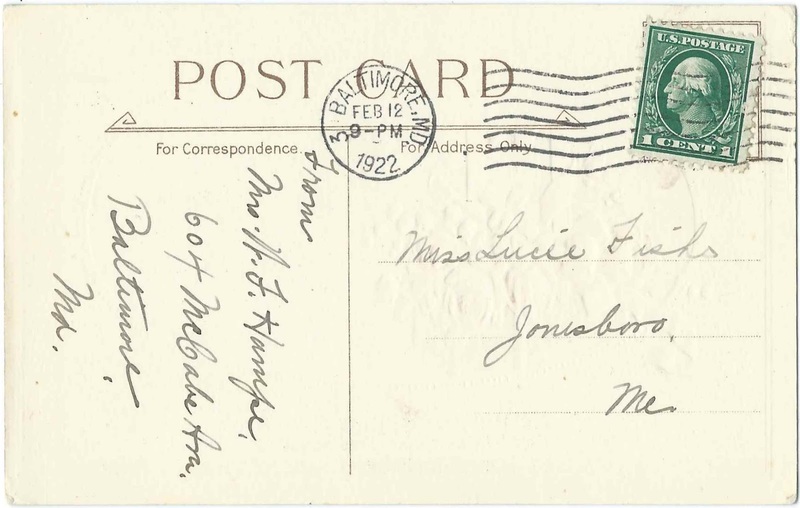 On November 13, 1890 at Monroe, Maine, Cora married Frank M. Fairbanks, son of Joseph Whitney Fairbanks and Elizabeth (Chase) Fairbanks of Monroe, Maine. Frank was born at Monroe in September of 1866, on the 15th, according to his obituary. 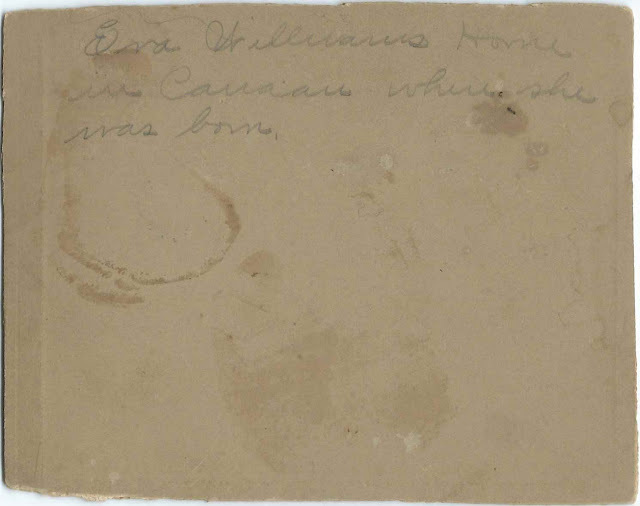 Frank inscribed a page in Cora's album on March 11, 1888. Frank and Cora lived at Monroe, Maine; Unity, Maine; and Pittsfield, Maine, and had at least one child, a son William L. Fairbanks, who was born in 1892 and died in 1922. 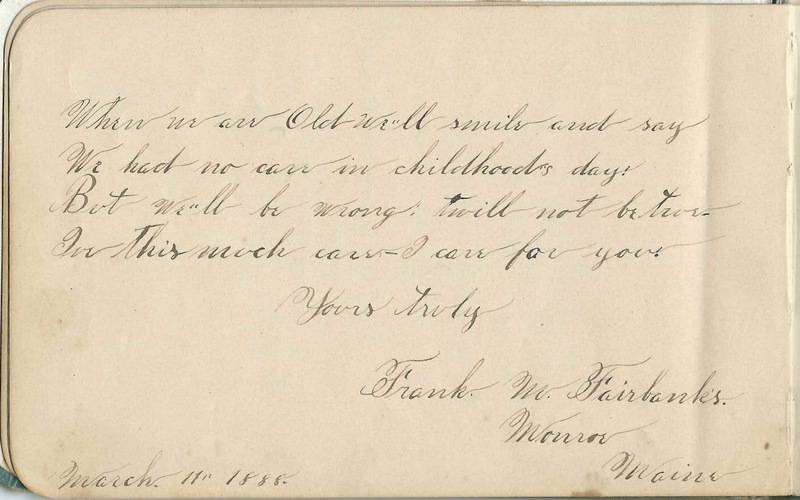 Frank worked as an undertaker and had a special interest in bands, as a member and benefactor. Frank died in 1940 and Cora in 1945. They're buried in the Pittsfield Village Cemetery at Pittsfield, Maine. Mrs. S. C. Woodman of Ellingwood Corner at Winterport, Maine, inscribed on July 8, 1889. She was Sarah (Colson) Woodman, wife of Josiah S. Woodman. 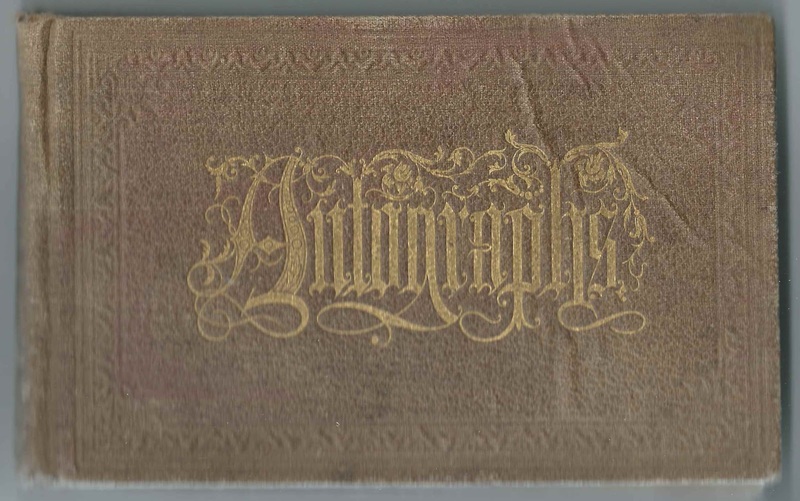 Autograph album started in February 1876 by Jennie P. Bamford of Fayette, Maine. 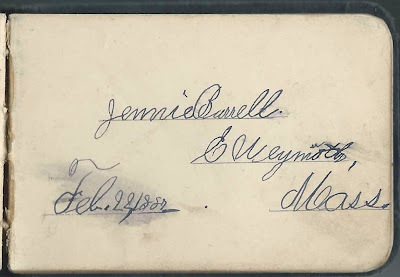 Three or more of the later autographs in the album, from the early 1900s, were inscribed to "Grammy", who was Jennie's mother Nancy Quimby (Bean) Bamford. Could Jennie have died or move away by this time and the album passed along to her mother? The album measures approximately 7" by 4-1/4" and contains the sentiments of 47 of Jennie's relatives, friends and schoolmates. An alphabetical surname list and an alphabetical list of the inscribers, together with any personal information they offered, appear at the end of this post. Jennie P. Bamford was born about 1860, presumably at Fayette, Maine, the daughter of Charles H. Bamford and Nancy Quimby (Bean) Bamford. Jennie was a student at the Maine Wesleyan and Seminary and Female College at Kents Hill at Readfield, Maine, at least in 1876. She was out of her parents' household by the time of the 1880 Census. Whether she was off teaching or was married or had died, I don't know. I found a web page that has information on a family Bible that belonged, initially at least, to Jennie's grandparents John and Mary (Quimby) Bean. Flora Alden, inscribed on December 17, 1876 "Sister spirit"
L. W. Bamford, inscribed at Fayette, Maine, on December 16, 1877. Jennie's grandmother. She may have been Relief (Whittier) Bamford, then widow of John Bamford. She was John's second wife. John and his first wife Phoebe (Sherburne) Bamford were the parents of Jennie's father Charles H. Bamford. Perhaps Relief went by "Leaf", accounting for her initials. Inscribed to "Grammy", who presumably was album owner Jennie's mother, Nancy Quimby (Bean) Bamford. 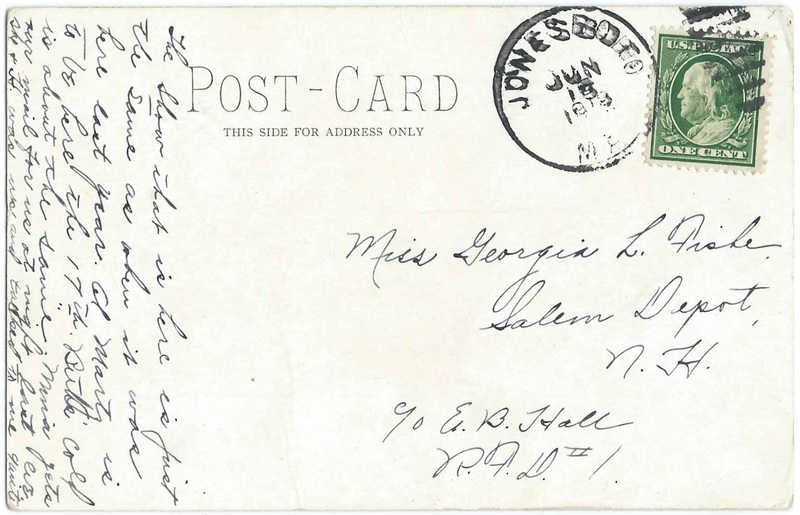 The inscriber was Jennie's namesake niece, Jennie P. Bamford of Fayette Corner, Maine, inscribed on July 21, 1906. The younger Jennie was born October 1, 1895 at Fayette, Maine. Inscribed to "Grammy", who presumably was album owner Jenni's mother Nancy Quimby (Bean) Bamford. 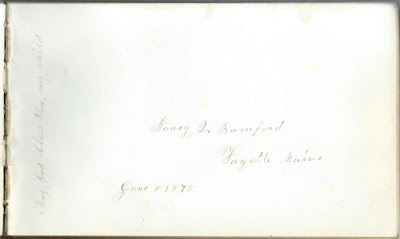 The inscriber was young John Henry Bamford of Fayette Corner, Maine, on July 21, 1906, son of album owner Jennie P. Bamford's brother, inscriber John Henry Bamford and brother of inscriber young Jennie P. Bamford. Young John was born September 20, 1892. Carrie I. Bean, inscribed at Fayette, Maine, on February 16, 1878. Carrie was the daughter of Amy Jane (Frost) Bean and Samuel Quimby Bean, who was a brother to Jennie's mother Nancy Quimby (Bean) Bamford. Mary A. 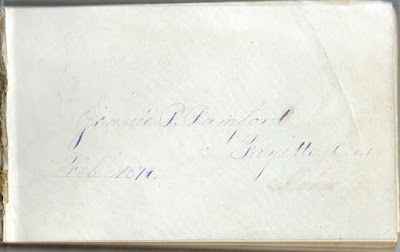 Chase of Fayette Corner, Maine, inscribed on April 13, 1877. The W. B. 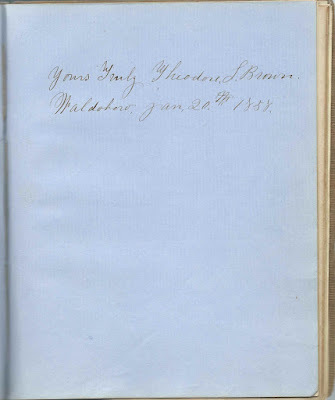 Chase who inscribed a page may have been her brother Ward B. Chase. W. B. 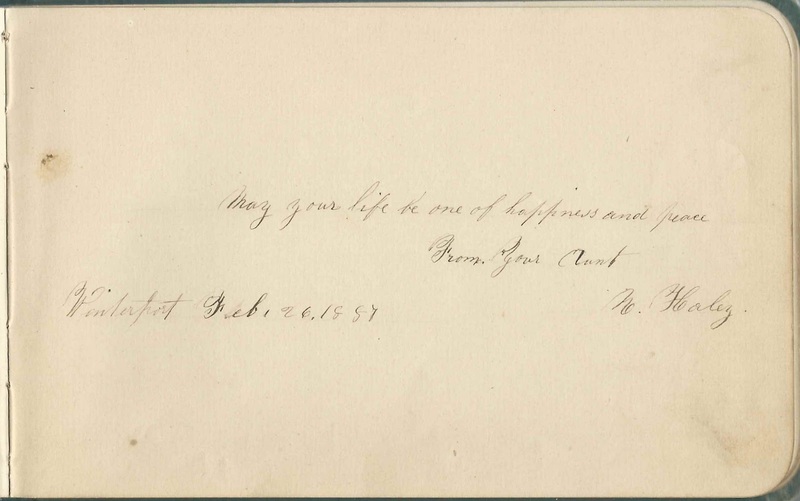 Chase, inscribed at Fayette Corner, Maine, on May 9, 1877. Presumably Ward B. Chase, brother of inscriber Mary A. Chase. Mary B. Coburn of Lowell, Massachusetts; Jennie's aunt Mary (Bamford) Coburn. 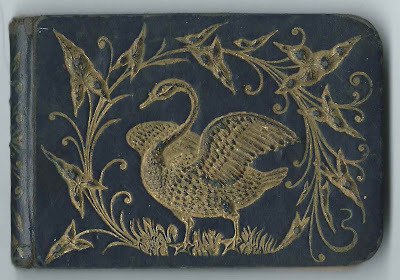 The G. W. Coburn who inscribed a page was presumably Mary's husband George Washington Coburn. George W. Coburn; presumably George Washington Coburn, husband of inscriber Mary (Bamford) Coburn of Lowell, Massachusetts, Jennie's aunt. Frank Coburn, inscribed at Lowell, Massachusetts on August 23, 1883 at Fayette, Maine; Jennie's cousin. His parents were George Washington Coburn and Mary (Bamford) Coburn, who was Jennie's aunt. Frederick Mortimer Currier of Mankato, Minnesota, inscribed to Aunt Nancy on August 4, 1898; inscribed to Aunt Nancy, presumably Jennie's mother Nancy Quimby (Bean) Bamford. 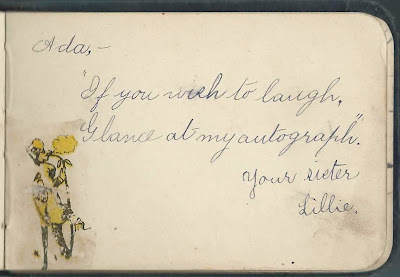 His wife, Ellen L. (Todd) Currier, "Nellie", inscribed the right facing page. Frederick inscribed another page in 1876, when he was living at Jamaica Plain, Massachusetts. Nellie L. Currier of Mankato, Minnesota, inscribed on August 4, 1898. 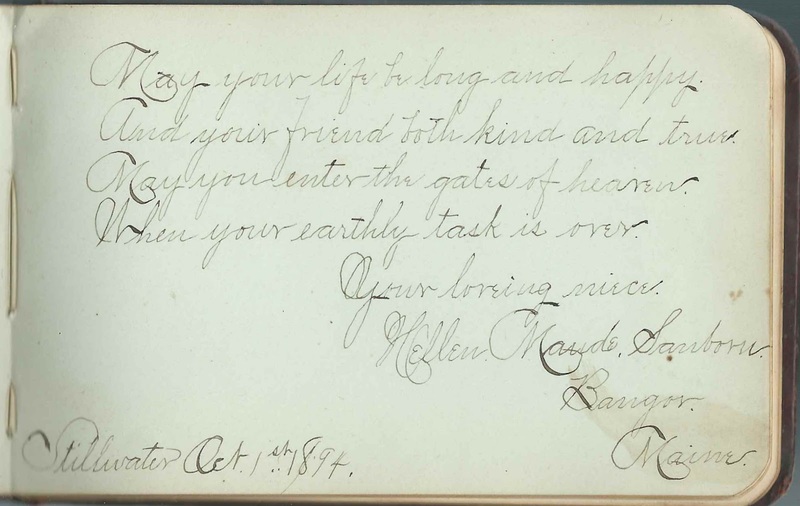 She was Ellen L. (Todd) Currier, whose husband, Frederick Mortimer Currier, inscribed the left facing page. 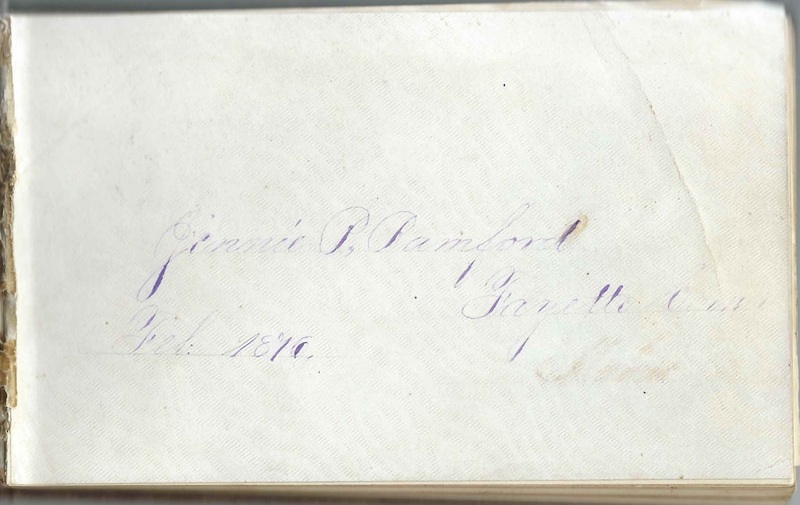 Carrie L. Danforth, inscribed on August 19, 1877. Her message dealt with how Jennie would live her life for the next 20 years, and she added the year 1897. "Will you look back at this in twenty years and feel that your work has been well and faithfully done?" Ida Fillebrown of Fayette Corner, Maine. She was Ida L. (Judkins) Fillebrown, wife of Charles T. Fillebrown. They married in 1872 but divorced in 1876. Ida kept the Fillebrown surname until her marriage to widower Harrison B. Wardwell in 1880. He had previously been married to Rachel Naomi (Washburn) Wardwell, who had died in 1879. He died in 1890. 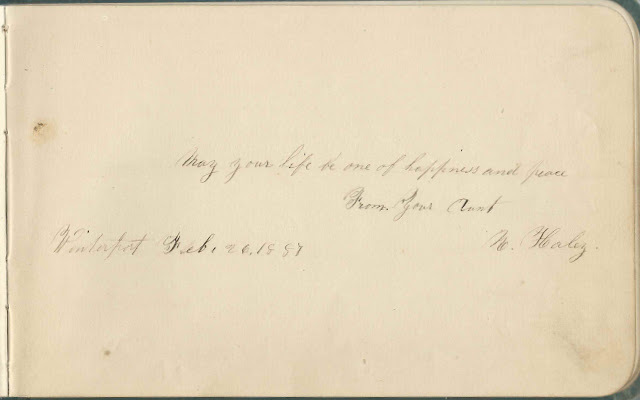 Herbert S. Gilson of Mount Vernon, Maine, inscribed on February 13, 1876. I. P. Hutchinson, inscribed at Fayette, Maine, on October 15, 1876. Presumably Isaac P. Hutchinson. 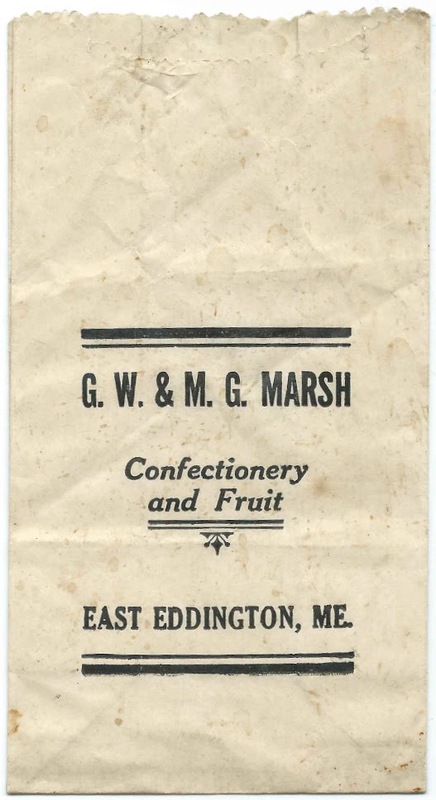 J. S. Judkins of Fayette Corner, Maine, inscribed on May 3, 1877 or 1879. Presumably the father of brother of inscriber Ida L. (Judkins) Fillebrown. Either Ida's father James Judkins or, more likely, her brother John S. Judkins. B. F. McLench, Oregon; presumably Benjamin Franklin McLench, born March 6, 1825 at Fayette, Maine; died in 1892 in Oregon, buried in Zena Cemetery in Polk County, Oregon. His wife Mary A. (Grey or Gray) McLench inscribed the right facing page. 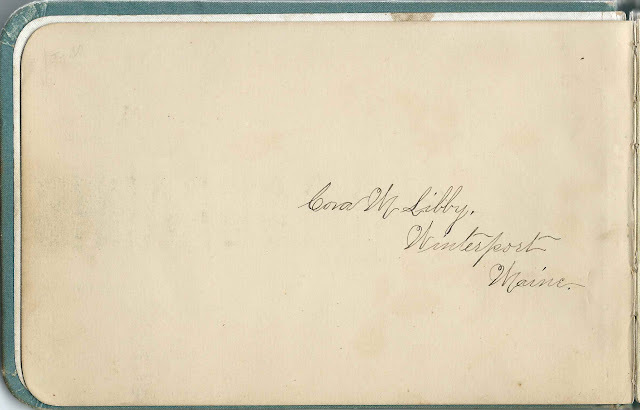 Mary A. McLench of Lincoln, Oregon, in Polk County, wife of Benjamin Franklin McLench, who inscribed the left facing page. She was Mary A. (Grey or Gray) McLench, born at Townshend, Vermont, on September 16, 1825; died at Salem, Oregon on December 4, 1907. Buried in Zena Cemetery in Polk County, Oregon. 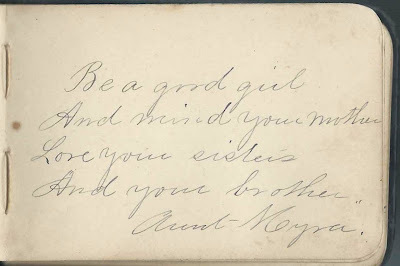 H. E. Nugent of Fayette Corner, Maine, inscribed on Mar 25, 1877. Presumably Harriet E. Nugent, daughter of inscriber Rev. Edmund Nugent and his first wife Sarah Griggs (Ricker) Nugent, and stepdaughter of inscriber Jane (Hart) Estabrooks Nugent. Jane H. Nugent, inscribed at Fayette, Maine, on March 17, 1877, presumably Jane (Hart) Estabrooks Nugent, wife of inscriber Rev. 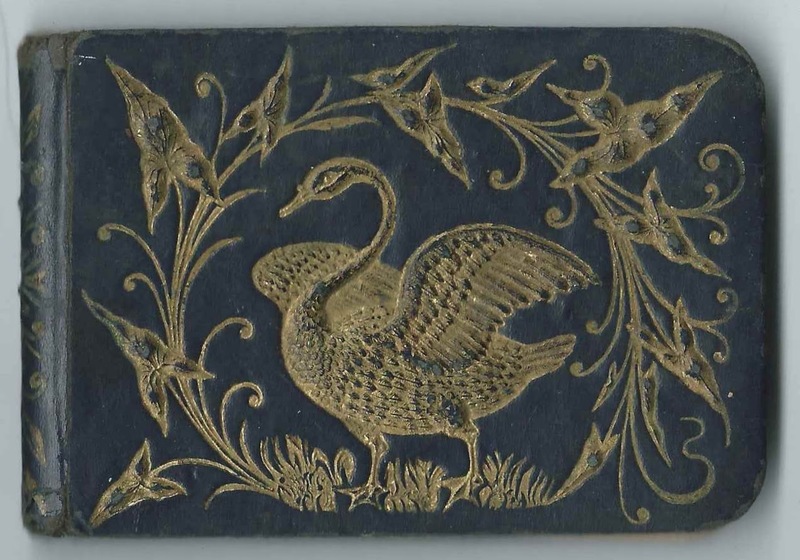 Edmund Nugent, who inscribed the right facing page, and stepmother of inscriber Harriet E. Nugent. E. Nugent, inscribed at Fayette, Maine, on March 20, 1877. Rev. 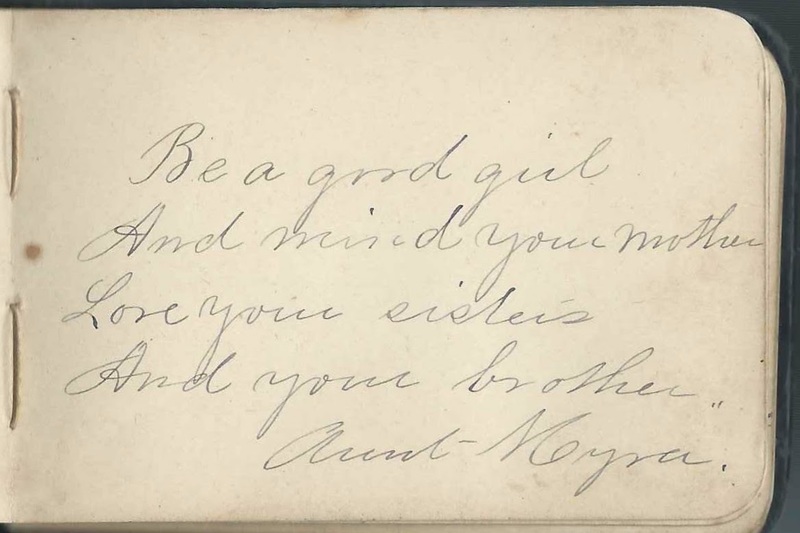 Edmund Nugent, a Lubec, Maine native, whose second wife Jane (Hart) Estabrooks Nugent inscribed the left facing page, and whose daughter Harriet E. Nugent, from his first marriage to Sarah Griggs (Ricker) Nugent, also inscribed a page. 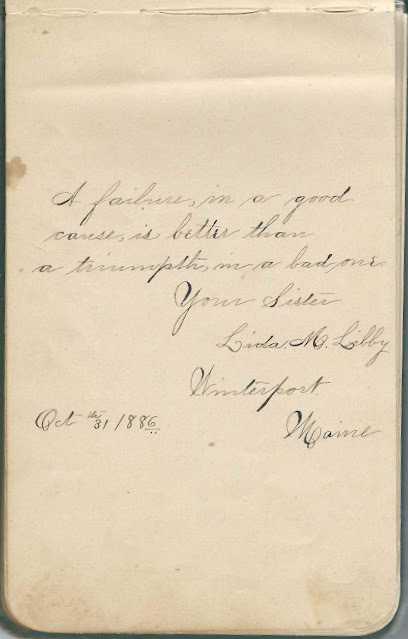 Emma C. Pratt of Fairfield, Maine, inscribed on October 23, 1876; mentions "Spelling - school"
Lydia Q. Robinson of, or inscribed at, Mount Vernon, Maine, on September 15, 1913. "Aged 89 years". Lydia Quimby (Bean) Robinson, sister of Jennie's mother Nancy Quimby (Bean) Bamford. 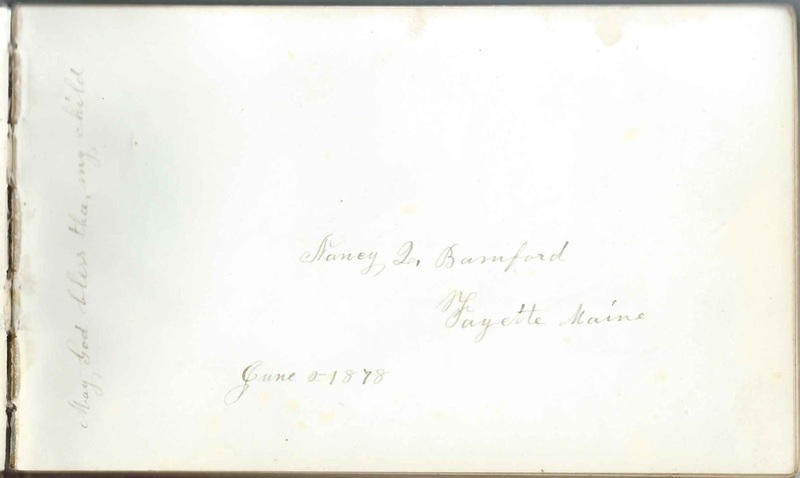 May Belle Sturtevant of Fayette Corner, Maine, inscribed on April 24, 1876. 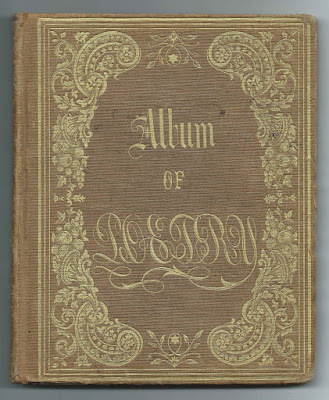 The H. E. Sturtevant who inscribed a page was presumably May Belle's mother Helen Elizabeth (Ormsby) Sturtevant, wife of Josiah Houghton Sturtevant; they inscribed facing pages in the album. H. E. Sturtevant; presumably Helen Elizabeth (Ormsby) Sturtevant, wife of Josiah Houghton Sturtevant and mother of inscriber May Belle Sturtevant, who inscribed the right facing page. J. H. Sturtevant, inscribed at Fayette Corner, Maine, on January 10, 1877. Presumably Josiah Houghton Sturtevant, whose wife Helen Elizabeth (Ormsby) Sturtevant inscribed the left facing page. 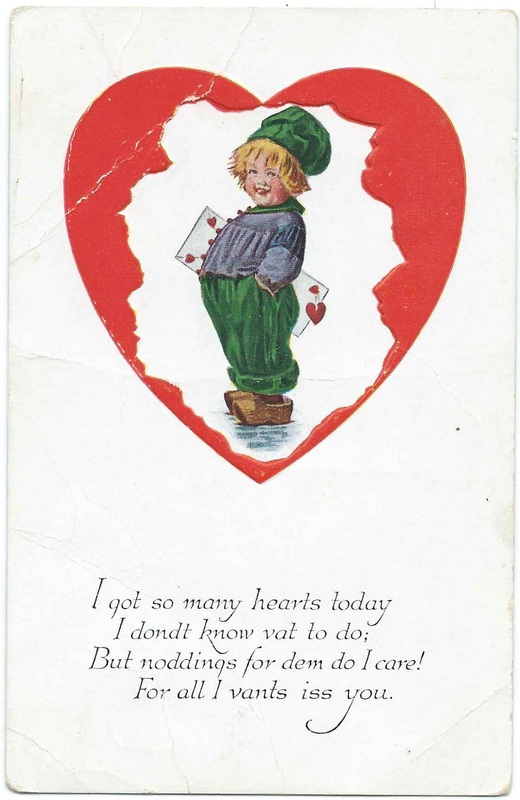 Their daughter May Belle Sturtevant also inscribed a page.